Case: Mulder is lost in the Devil's Triangle while investigating the re-emergence of the 1939 Queen Anne. "So in case we never meet again–"
You know, I guess the writers were sitting around one day and thought – so far things have been ‘pretty fun’ but let’s make them REALLY fun! 'Triangle' is part Back to the Future and part Wizard of Oz, a time-bending hour of television that's nothing short of a fancy magic trick that Chris Carter pulled off, with lots and lots of courage and what could only be described as his abiding love for this show. The episode was conceived to give the appearance of four long takes, one for each of its four acts (a la Rope, according to Carter). In the end, there were something like 3 dozen shots, stitched together seamlessly, which is an amazing feat in and of itself – the whole enterprise being something that very few TV directors (maybe even none other than Carter) were bold enough to attempt, then or now. It was just a ludicrous idea on every level from a network TV schedule and budget standpoint. (By the way, the fact that they ended up with almost 40 cuts was because of the limitation of how much film the steadicam could hold, not because of the limitations of the human beings involved!) The effect is a tense, claustrophobic, first-person driving adventure on the circuitous Queen Anne and inside the equally roundabout J. Edgar Hoover building. And that's just the visuals. In a deeper cosmic sense for the show's themes, Mulder and Scully again go to bat for the other, against greater forces, in this case, across the time space continuum. Here characters, in general, and their motivations hold true through history, for better or worse. A realization that loyalty is, at best, rare, if ever truly a part of the human experience at all is woven into 'Triangle'. Both conceits cynical but consistent with the worldview on The X-Files. Told through this dramatic and stylized angle, it's abundantly clear that if your 'home' includes another person willing to stand by you in life or death unconditionally then, yeah, there's no place like it. And we have another episode (most recently 'Folie a Deux') where Scully's sheer faith in Mulder means an against the odds victory for them, professionally and personally. They live to fight another day, with one another. It's the reiteration of The X-Files favorite equation: one + one = three. (Mulder + Scully = their relationship, the third entity, never not present.) And while there's a decidedly whimsical quality to the storytelling, even the characterizations in 'Triangle,' it is in all seriousness the depth in which Mulder is recognizing the import of the emotions they share between them. of Gillian Anderson? I'll take my chances. A close watch at the scene where he kisses 1939 Scully shows a man well-aware of their fused future past, that if this truly is his only instance in time to convey his passion for the woman in front of him, he's not going to squander it. And in that echo, of course, is all of the opportunities he has missed along the way to communicate this in unmistakable fashion. (How also brilliant is it then that she clocks him after?!) 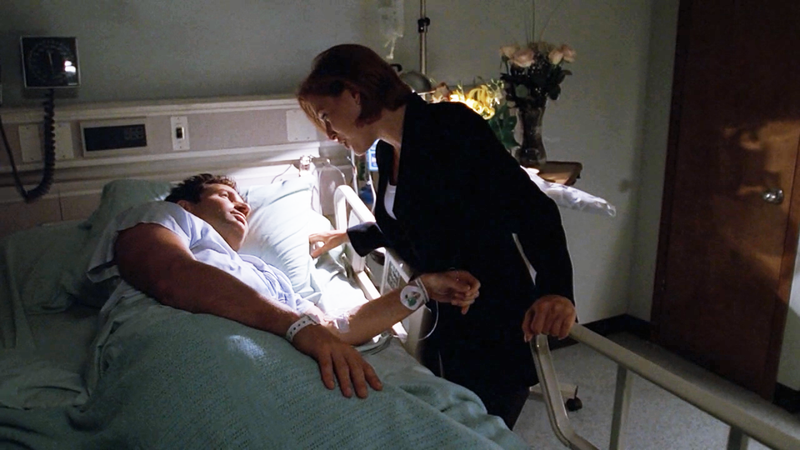 So, in fine form, when Mulder steals that private moment between them in the hospital to tell Scully he loves her, it closes a five season (and a movie!) long circle. Inside a triangle. If you will. You guys, they kiss for a LOOONG time. Seriously. Kersh's secretary as the ship's featured performer. Totally laughed in Act III when the British soldier quasi-believes Mulder really is from the future for a minute. There are a half a dozen examples in the script where Chris Carter really went the extra mile to deliver something believable (all that German not withstanding!). I.E. "Navy AWACS S.L.A.R. or S.A.R. 100 k swath imaging.” Bless. It’s so adorable in the midst of all of this worry about Mulder's location that rational Scully’s like, wait a sec, I can just call Mulder! What would this show have been without cellphones? These little magical devices are symbols of their private hushed shorthand. I'd be remiss not to include a nod to this. Frohike: "The walls have ears." Scully: "I have ears. Now would you tell me what’s going on–"
Shipmate: "What's wrong with you! Don't you know there are spies everywhere?! Trust no one, mon." 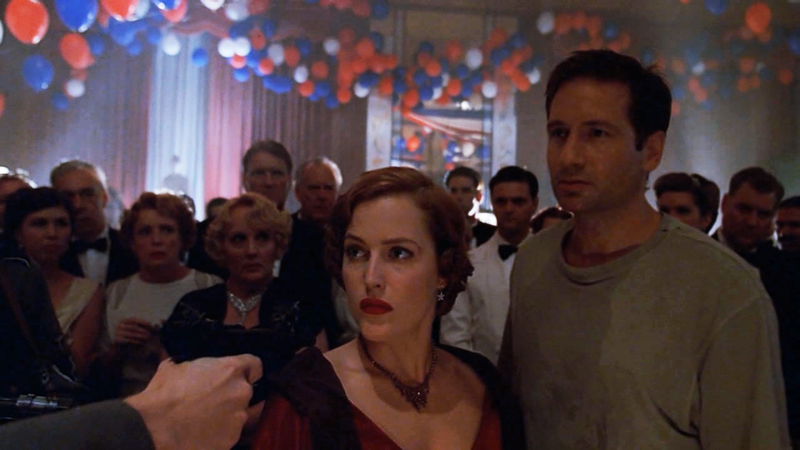 Mulder: "I can try to explain it to you..."
1939[Nazi]Skinner: "God bless America. Now get your asses out of here." Mulder: "You were there, Scully." Final Analysis: I'd go to the Bermuda Triangle with you, anytime, Chris Carter. This is one of the top five standouts of the series. Completely agree, Heather, that this is one of the top episodes of all time. Technically it is a masterpiece that everyone involved in should be proud of. The long, long takes are simply magnificent and, as you say, add to the tension and the atmosphere of this episode. My favorite shot is the two Scullys passing each other in the hall. Anderson pulls off that visual stunt with aplomb. Many critics of this show dislike the beginning of season six. They find it too frivolous, too light. They believe the show strayed too far from its roots. Perhaps it did, but the episodes we are watching now spotlight what, for me, made the show so magnificent -- the relationship between Mulder and Scully. Mulder: "Scully, I love you." Scully, rolling her eyes and walking away: "Oh, brother." Mulder reaches up to his face. It is tender from her right hook. The smile on his face just melts my heart. Great review of one of the greats! This episode is bonkers. I love how they made it so it could have been a dream. And the tracking shots. And Scully was absolutely awesome in both timelines. I especially liked the two shot where both Scullys crossed paths. I don't think it says so but this episode was obviously filmed on the Queen Mary in Long Beach. I've toured that ship twice.